This is an interesting province of Canada. The island of Newfoundland and the land of Labrador are one province. The total population is about 530,000 with about 30,000 of them on Labrador. It is not clear to us why Labrador is part of Newfoundland and not part of Quebec province but that will be for another time. First off ... you have to learn how to pronounce the name of the island of Newfoundland. It is "newf-n-land" with the accent on "land". One of the locals told us to say "understand newfoundland" and if it all rhymes you are probably saying it correctly. This is really a land of small fishing villages along the coast of an island that is solid rock. That is all that is left after the glaciers shaved it. There is some soil on the top of the rock but for the most part it is difficult farming country. The main industry used to be cod fishing but most of the cod have been fished out. This is a political "hot potato" and we won't get in to that discussion. We heard a lot of different versions from many different people but the bottom line is that there are some very poor areas and a lot of people trying to learn a different way of life after generations of knowing only how to fish for cod. The people are truly friendly. Most places they don't lock their houses and leave the keys in their cars. We stopped in a village on Labrador for lunch and our bus driver wanted to go to the top of a hill across the bay so he asked a local if he could use his truck and was told "sure, I won't be needing it for awhile". The roads here are truly UGLY. There is one that is good most of the time and that is the TCH (Trans Canadian Highway). But that doesn't take you to many of the places that you want to see. So, like in Alaska, you just slow down to 40-45 mph and take a little longer to get there. Of course, if you are driving in the early morning or late evening, that is a good idea anyway because of the moose that like to browse on the good roadside vegetation. On one of our early morning bus rides we saw 58 moose in about 50 kilometers (30 miles). 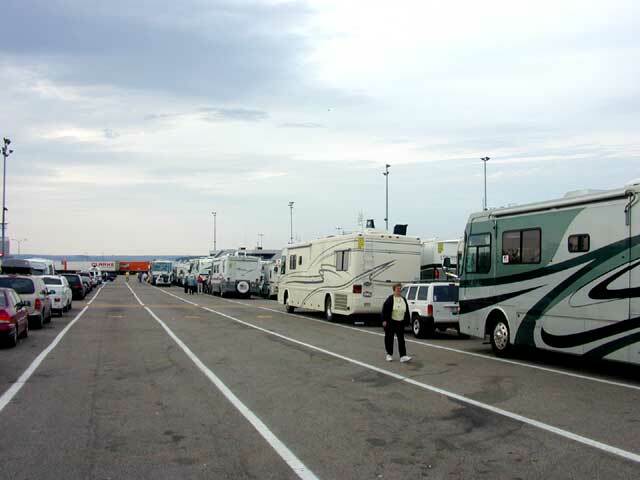 Here we are sitting in line waiting to load onto the Newfoundland Ferry. It will take us about five hours to get there from Nova Scotia and then unload and head for our campground. It is a cool and overcast morning in North Sydney and it will be foggy when we get to Port Aux Basques. Then a short run to our campground. So far we have not outrun our access to the internet and even our sat TV is still working. 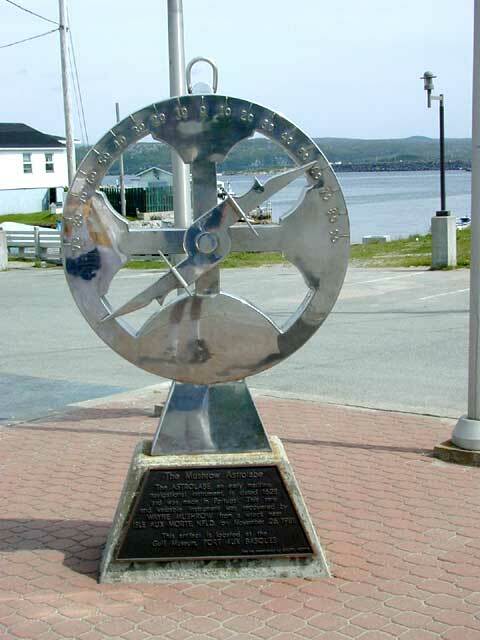 Port Aux Basques is the Newfoundland port where our ferry arrived. It has a very interesting maritime museum that contains two very old and valuable astrolabs. These were discovered nearby, while diving on a very old wreck. They were made in Portugal around 1628 and were recovered in 1981. An astrolab was the predecessor to the sextant. And, like a sextant, it was used to measure the elevation of a star in the sky. However, it was not as accurate, since it was dangled from a swivel held in the hand as the user sighted through holes on a rotating bar. When the holes lined up on an object being observed, the pointer on the end of the bar was used to read the angle of elevation. When used on the North Star it provided a good estimate of a latitude. 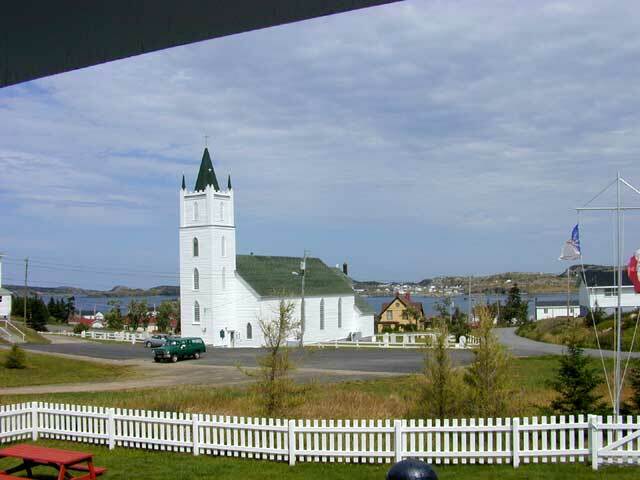 In Port aux Port is this wonderful Catholic Church named Our Lady of Mercy. Not shown are 14 stations of the cross carved out of Carrera marble and framed with Travantine marble. We particularly liked the reproduction of the Last Supper painted on the front of the altar. Quite unique. 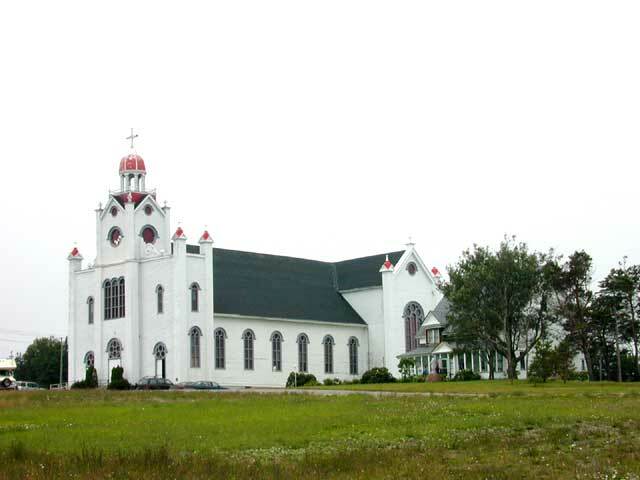 It is also the largest all-wooden structure in Newfoundland. Feeding an alpaca! Who would have thought it would happen. Actually they apparently love clover which just happens to be growing just outside of their fence. 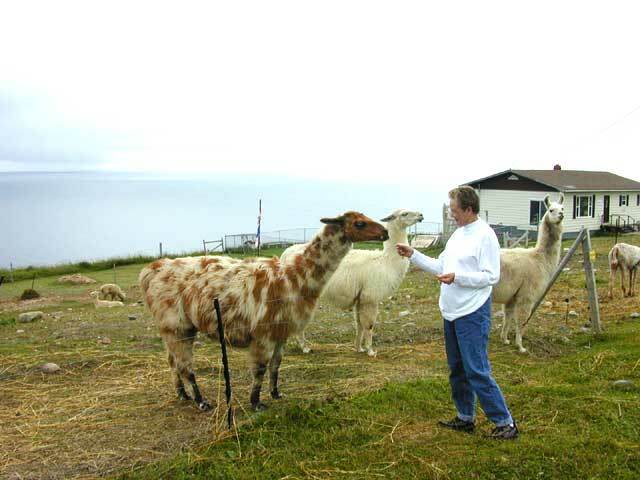 It is a treat for them and they are very gentle about taking it out of your hand. This has been designated as a World Heritage Site by UNESCO to try and protect it for the benefit of all. 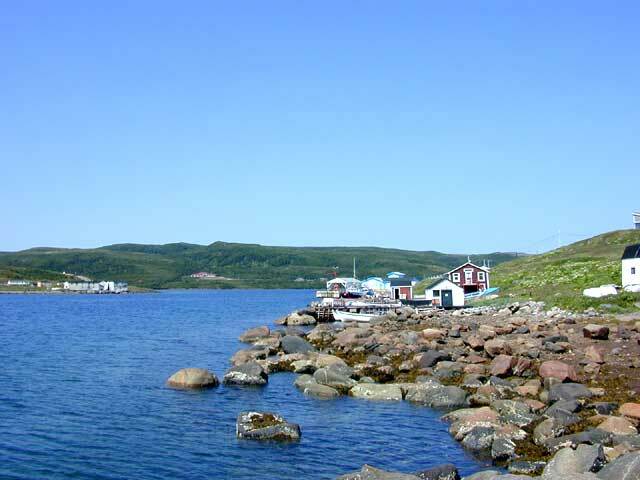 This is typical of a fishing village in Labrador. 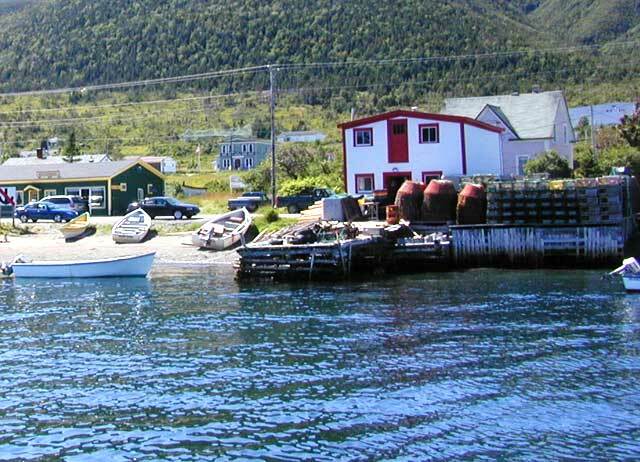 It is quite small - the population of Red Bay is 300. 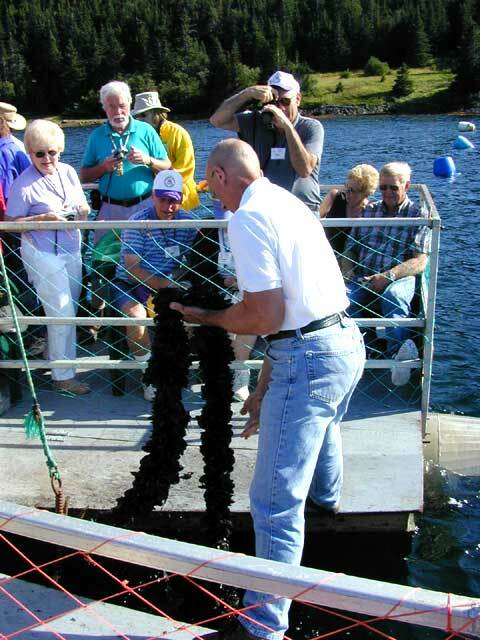 They make their living now catching lobster and crab and of course tourism contributes some. At every stop there was a craft and/or gift shop that carried local crafts. This is currently not the season for lobster and crab so the pots are stored on shore ready to be used for the next season. The crab pots are the red round ones. The crab crawl up the sides to get at the bait down in the center. There is a plastic funnel inside the top and once they get down to the bait they can't crawl out again. With the lobsters there are two areas and again going after some bait in the trap, they are led into an area where there is no exit for them. The shape of them is difficult to see but they are shaped like a small quonset hut with the entry at one end. This is what one of the shorter lines looks like with the mussels attached. It takes several years for the mussels to mature but it seems like it will be a successful industry. Both of us tried the mussels and only one of us liked them. But we now are entitled to an opinion since they were sampled. Religion plays a major role in the lives of these people. The vast majority of the churches are in wonderful repair and may not be elaborate but are well maintained and tidy. One of the most fun entertainment that we had on this trip was done by a senior church group. They had a comedienne who had to be at least 85 and was the funniest lady we had ever heard. She had a huge repitoire of jokes in her head and told them all deadpan - she was delightful. From the Round Top lookout. This is another example of an isolated fishing village. They are being allowed to do some experimental cod fishing under government control to see how well the cod are coming back. This is pretty isolated even for a lot of tourists but we had an interesting time driving out here. We got to the top of this point in four-wheel drive but it was worth it for the view. Don't know why they gave it this name but it is a beautiful formation. 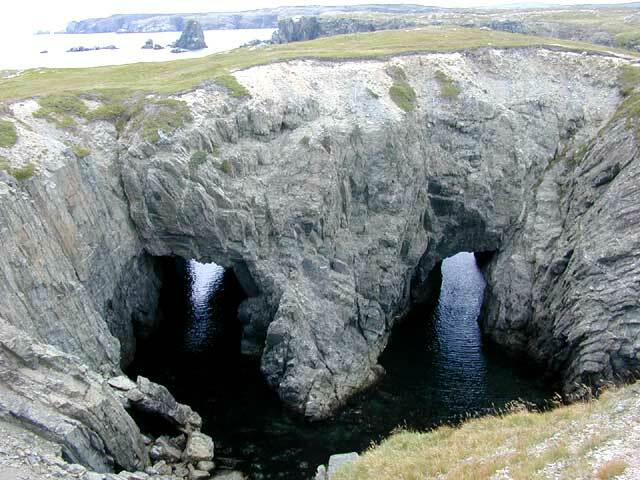 We were there on a calm day but Cape Bonavista can be very treacherous. 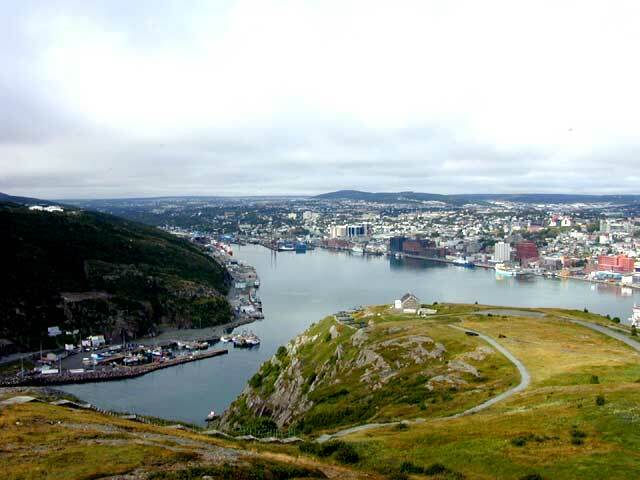 St. Johns is by far the largest city on Newfoundland and also has the oldest commercial district. 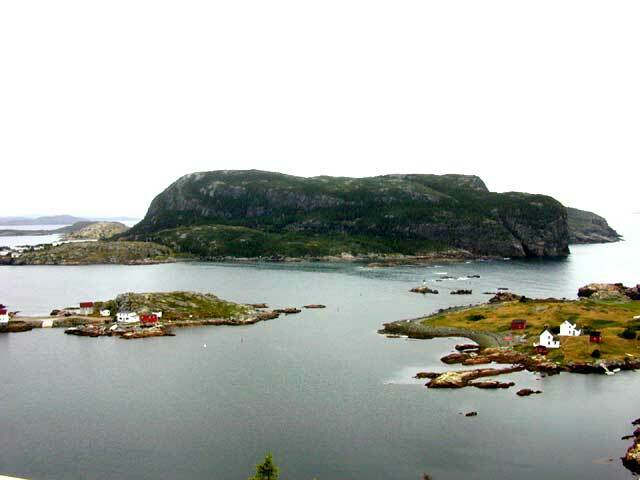 It is a very sheltered harbor with access through a very narrow inlet. It was a major staging area for convoys during WWII and therefore had a pack of U-boats that were always laying in wait outside the harbor mouth. One U-boat even tried to shoot two torpedoes through the inlet into the harbor. They exploded when they hit the side of the narrow inlet. It would be very unlikely that you could send one of those WWII torpedoes through the inlet and I guess it did not make sense to waste them trying. Had a fun time at a real Irish pub here. Food was just like in Ireland and the Guiness was as good as it could be outside of Dublin. After the tour of St. Johns church we were invited into the residence of the order of the sisters - can't remember the name of their order. Inside their home is this beautiful bust. It was a gift to their order. We have seen one quite similar to this in Europe but this is another beautiful example. It is all done in Carrera marble. 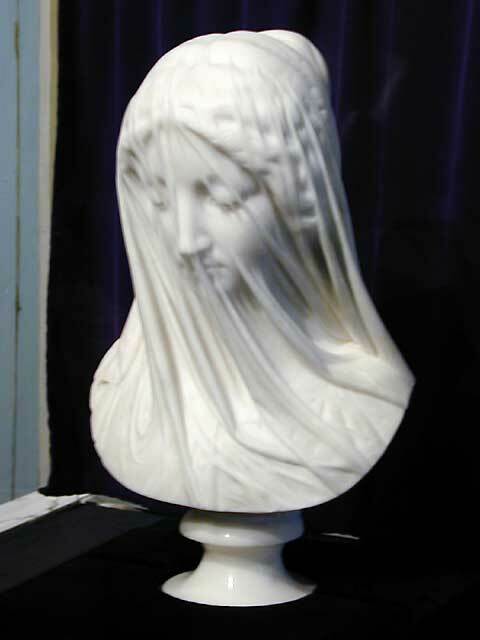 Just unbelieveable that you could do such a thing in stone.